An online school for champions - B.A.B.E. Yes we know that studying acting around our busy schedules, voiceovers, auditions, rehearsals, networking, coffees and those dreaded other jobs makes it a challenge. And it can be even harder to keep to a weekly schedule on a set day of the week – it means we often miss out on things, and have to say no to other events when we want to say yes. And this is why I’m always a fan of online training. I mean come on, we live in the 21st Century after all. And online is the way forward (stay tuned as I’ll be telling you more about B.A.B.E. online stuff in the coming months too). Right now, my buddies over at StageMilk – who I am a huge advocate of – have put their annual online acting course up for enrollment – with a 10% off discount just cause you’re a B.A.B.E. believer. I know the StageMilk gents (and ladies on the team) personally and can say hand on my heart they are a wonderful, skilled and talented bunch. I HAVE done their courses myself. I HAVE attended their webinars too. I HAVE met them. They’re the real deal! If you are thinking that you need a refresher, and perhaps a little kick up the bottom to get you swiftly moving into the last quarter of the year (well almost) then this course is for you. This 8 week program is jam packed with amazing goodness where you will do voice work, plays, script work, screen work, Shakespeare and more. Why do I say sign up? I have been working alongside StageMilk for a while now (you’ll see I mention them over on our Resources Page too) and I have watched their webinars and online training. The courses and content are exceptional. Which is why I want you to know about StageMilk Drama School. For every person who signs up to their course, I’m offering a free 30 minute coaching session with me. We will meet on Skype and work through one of your topics of interest like I do with my current clients – maybe you want some email tips, info on places to find auditions, help with your current website, social media or what you’re writing to casting directors. You pick the topic and we will do it together. The course is open now until the 10th September, so you don’t have much time. You do get 10% off the course if you use this LINK to sign up. So give yourself permission to smash through the last quarter of the year and get your acting to the A level you’ve been dreaming about. Sign up to the Stage Milk drama course now. 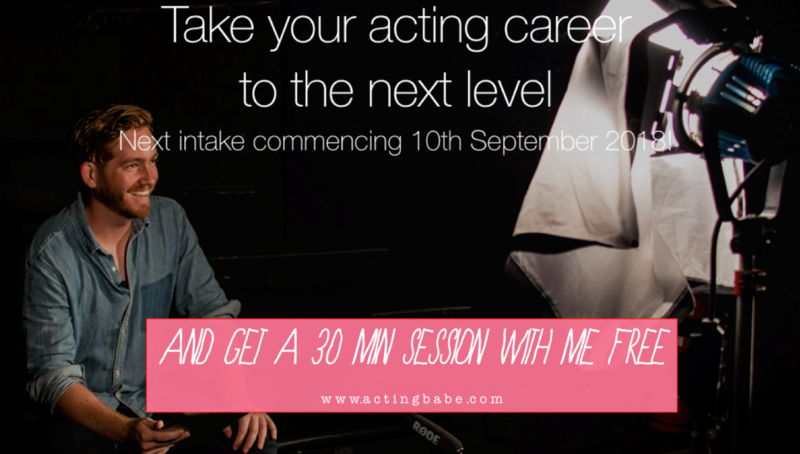 Take your acting to the next level with this amazing course. Sign up to the StageMilk Drama course by the 9th September. We will schedule in a FREE 30 minute mentoring session, valued at £40. How cool is that! And if we meet in person, I’ll even buy you a coffee. *I only endorse courses that I truly believe in. I’ve done StageMilk courses myself and hence why I am now an affiliate and true believer! I’ll continue to do their courses and work with this organisation for years to come.